FKLI futures July contract rose 2.5 points higher to close at 1157 as compare to previous trading session with total 6,558 lots traded in the market. FKLI close slightly higher after some weekend profit taking activities take place despite Dow Jones and regional equity indices were traded firm during trading session. Technically, FKLI again tested the upper resistance trend line in 15min price chart around 1164 regions. Based on our technical analyst, our opinion still suggests FKLI would likely to trade lower in the coming trading session with resistance seen at 1160 and 1166. Traders were suggest to hold short position provided resistance level must not be violated during trading session while be alert around support levels seen at 1151 and 1145 regions. FCPO 3rd month Oct Futures contract rose RM22 higher to close at RM2122 levels as compare to previous trading session with 7,858 lots traded in the market. CPO price rebound strong after dipped low at RM2060 regions in the early sessions. 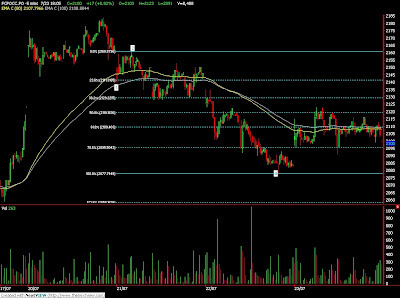 Technically, CPO price completed objective price at RM2062 levels at 161.8% Fibonacci projection levels and expected complete rebound levels at RM2134, 78.6% Fibonacci retrace levels. Based on our technical analyst, our opinion suggests CPO price would trade lower provided resistance levels at RM2140 and RM2180 were not violated. Traders were suggest to hold short position provided resistance levels were not breached while be extra alert support levels at RM2090 and RM2060 regions. July 24 (Bloomberg) -- Crude oil climbed to a three-week high on optimism that the U.S. economy is strengthening and that fuel consumption will rebound later this year. Oil increased 7.1 percent this week, the biggest gain since May, as companies such as EBay Inc. and Ford Motor Co. posted better-than-expected earnings. Yesterday, the Standard & Poor’s 500 Index rose to the highest level since President Barack Obama was elected on Nov. 4. Stocks fluctuated today. Crude oil for September delivery rose 89 cents, or 1.3 percent, to $68.05 a barrel at 2:50 p.m. on the New York Mercantile Exchange, the highest settlement since July 1. Futures are up 53 percent this year and down 54 percent from a record $147.27 reached on July 11, 2008. Gasoline for August delivery increased 0.27 cent to end the session at $1.9159 a gallon in New York, the highest settlement since June 29. Heating oil for August delivery climbed 1.69 cents, or 1 percent, to $1.7813 a gallon, the highest close since June 29. Federal Reserve Chairman Ben S. Bernanke said at a House Financial Services Committee hearing today that the central bank is “winding down” emergency measures established to end the financial crisis. Oil has increasingly moved in tandem with benchmark stock indexes. The Dow Jones Industrial Average and U.S. crude futures showed a correlation of 0.7 the past month, up from 0.06 in December, according to data compiled by Bloomberg. A correlation of 1 means the two moved in lockstep. Crude-oil supplies dropped 1.8 million barrels to 342.7 million last week, an Energy Department report on July 22 showed. The reduction left nationwide crude stockpiles 7.3 percent higher than the five-year average for the period. Gasoline inventories climbed 813,000 barrels to 215.4 million last week, the sixth-straight gain, according to the report. Stockpiles of distillate fuel rose 1.22 million barrels to 160.5 million, the highest since January 1985. Brent crude for September settlement on London’s ICE Futures Europe exchange rose $1.07, or 1.5 percent, to end the session at $70.32 a barrel. It was the highest settlement price since June 29. The Organization of Petroleum Exporting Countries will trim shipments by 1.7 percent in the four weeks ending Aug. 8 as refinery maintenance and faltering demand encourage members to implement supply cuts, consultant Oil Movements said yesterday. OPEC will reduce exports in the period to 22.39 million barrels a day from 22.78 million a day in the month ended July 11, the tanker-tracker said. It’s the sixth consecutive drop reported in Oil Movements’ weekly reports. Oil may decline next week because of fuel-supply increases and demand that trails earlier years. Twenty-two of 42 analysts surveyed by Bloomberg News, or 52 percent, said futures will fall through July 31. Nine respondents, or 21 percent, forecast that prices will be little changed, and 11 expected a gain. Total U.S. daily fuel demand averaged 18.6 million barrels in the past four weeks, down 4.8 percent from a year earlier, the July 22 Energy Department report showed. Crude oil volume in electronic trading on the Nymex was 350,396 contracts as of 2:58 p.m. in New York. Volume totaled 608,957 contracts yesterday, 20 percent higher than the average over the past three months. Open interest was 1.18 million contracts yesterday. The exchange has a one-business-day delay in reporting open interest and full volume data. July 24 (Bloomberg) -- Oil fell from a three-week high as disappointing results from Microsoft Corp., American Express Co. and Amazon.com Inc. raised doubts about the economic recovery in the largest energy consuming nation. Oil slipped as U.S. stock futures dropped from an eight- month high, after Microsoft posted profit and sales below analyst estimates and Amazon.com missed sales projections. U.S. fuel use averaged 18.6 million barrels a day the past four weeks, 4.8 percent less than the same period a year earlier, the Energy Department said July 22. “Unless demand or demand expectations can really validate themselves, the price of oil might be a bit hesitant of following the stock market too high if it continues to rally,” said Mike Sander, an investment adviser with Sander Capital in Seattle. Crude oil for September delivery dropped as much as 64 cents, or 1 percent, to $66.52 a barrel on the New York Mercantile Exchange. It was at $66.78 at 9:16 a.m. Sydney time. Yesterday, it rose 2.7 percent to settle at $67.16, the highest since July 1, after a gain in U.S. home purchases. Futures are 4.3 percent higher this week. S&P 500 futures expiring in September declined 0.4 percent to 965.10 at 7:31 a.m. in Tokyo. Dow Jones Industrial Average futures dropped 31 points, or 0.3 percent, to 8,960. Yesterday, the Standard & Poor’s 500 Index advanced 2.3 percent to the highest level since President Barack Obama was elected on Nov. 4. Brent crude for September settlement gained $2.04, or 3 percent, to $69.25 a barrel yesterday on the London-based ICE Futures Europe exchange. July 24 (Bloomberg) -- The yen headed for a second weekly decline against the euro as Asian stocks extended a worldwide rally on improving company earnings, damping demand for the relative safety of Japan’s currency. The yen weakened versus 14 of the 16 most-traded currencies today as Japanese financial companies prepared to raise at least 700 billion yen ($7.36 billion) for funds that will invest globally. The Australian and New Zealand dollars rose, set for a second weekly gain against the greenback and the yen, after the Standard & Poor’s 500 Index advanced to an eight-month high. The yen traded at 134.41 versus the euro as of 9:11 a.m. in Tokyo from 134.30 yesterday in New York, heading for a 1.2 percent loss this week. 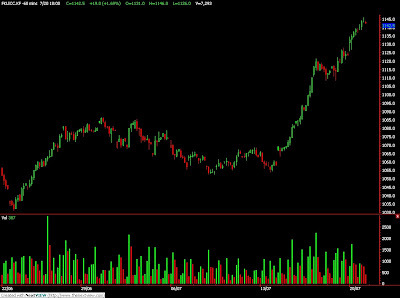 Japan’s currency was at 94.93 per dollar from 94.92. The dollar bought $1.4155 per euro from $1.4143, poised for a 0.4 percent drop this week. Australia’s currency rose 0.2 percent to 77.26 yen and gained 0.2 percent to 81.39 U.S. cents. New Zealand’s dollar climbed 0.2 percent to 62.15 yen and advanced 0.2 percent to 65.48 cents. Demand for the yen weakened after U.S. stocks surged yesterday with the Dow Jones Industrial Average exceeding 9,000 for the first time since January and the S&P 500 Index gaining 2.3 percent. The Nikkei 225 Stock Average advanced 1.4 percent today to 9,927.69, extending its gained this week to 5.7 percent. Benchmark interest rates are 3 percent in Australia and 2.5 percent in New Zealand, compared with 0.1 percent in Japan and as low as zero in the U.S., attracting investors to the South Pacific nations’ higher-yielding assets. The risk in such trades is that currency market moves will erase profits. Japanese financial institutions are encouraging investors to put money into mutual funds this week focused on assets denominated in currencies such as the South African rand and Brazilian real, according to data compiled by Bloomberg. The euro headed for a weekly gain versus the dollar before a European report today that economists said will show the region’s manufacturing and service industries contracted at a slower pace this month. A composite index for the 16-nation euro area rose to 45.3 in July from 44.6 in June, according to the median forecast of economists surveyed by Bloomberg News. A reading below 50 indicates contraction. The Ifo institute’s business climate index, based on a survey of 7,000 executives, increased to 86.5 from 85.9 in June, according to a separate Bloomberg survey before the organization releases the survey today. “Any downside impetus for the euro-dollar is dissolving for the near term as positive investor sentiment continues to build,” Emmanuel Ng, an economist in Singapore at Oversea- Chinese Banking Corp., wrote in a research note yesterday. FKLI futures July contract rose 9.5 points higher to close at 1154.5 as compare to previous trading session with total 6,219 lots traded in the market. FKLI opened higher as regional indices firm performance but retrace latter due to profit taking activities. 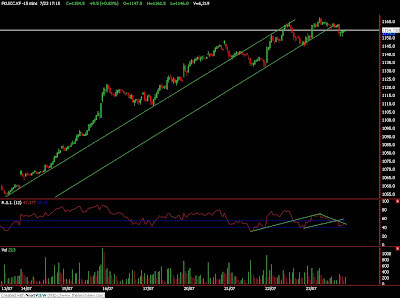 Technically, FKLI manage to test resistance level at 1161.5 regions before break down from the uptrend channel in the later trading session. Based on our technical knowledge, our opinion suggest FKLI would trade lower in the coming trading session provided FKLI not able to breach resistance levels at 1164 and 1171 regions. 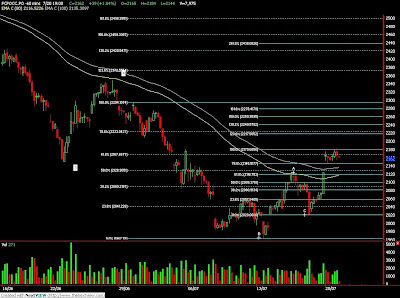 Traders were advice to hold short position while be cautious around support levels at 1145 and 1131.5 regions. FCPO 3rd month Oct Futures contract plunge RM59 lower to close at RM2084 levels as compare to previous trading session with 10,878 lots traded in the market. CPO price plunge since market open for trading as soybean oil and crude oil were traded lower during electronic trading. Technically, CPO seems manage to rebound 50% Fibonacci projection levels at RM2121 regions but traded sideways during trading session. Based on our technical analyst, our opinion suggest CPO price would traded lower in the coming trading session provided resistance levels at RM2129 and RM2143 were not violated. Traders were advice to hold short position in the coming trading session while be alert around support levels at RM2087 and 2070 regions. July 23 (Bloomberg) -- India, the world’s largest vegetable oil buyer after China, may produce fewer oilseeds as dry weather in the biggest growing areas reduced monsoon sowing of peanuts, soybeans and sesame seeds. Production may be less than the 15.07 million metric tons estimated by the industry’s largest trade group for the monsoon crop last year, Govindlal G. Patel, director of Dipak Enterprises, said in an interview yesterday. Patel, 70, has been trading oilseeds for more than four decades. India’s cooking oil imports may be 8.4 million tons in the year starting November, 5 percent more than estimated for this year, Patel said. Higher purchases by the South Asian nation may help arrest a slide in the price of palm oil, which has declined 24 percent since reaching a nine-month high in May. The tropical oil accounts for 90 percent of India’s edible oil bought abroad. Oilseeds were planted on 10.7 million hectares (26.4 million acres) as of July 16, down from 11.03 million hectares at the same time last year, the agriculture ministry said last week. Farmers may pare area by as much as 800,000 hectares from 18.44 million hectares sown for the monsoon crop last year, because of inadequate rains, Patel said. Showers have been below average so far in Gujarat, Andhra Pradesh and Tamil Nadu, the nation’s biggest growers of peanuts, and in Madhya Pradesh, Maharashtra and Rajasthan, India’s three biggest growers of soybeans, according to the India Meteorological Department. “Everything depends on rains in August and September,” said Davish Jain, president of the Central Organization for Oil Industry and Trade, India’s biggest group of processors. The monsoon crop, which provides more than 60 percent of the oilseeds, is sown in June and harvested in mid-September. October-delivery palm oil gained 1.9 percent to 2,122 ringgit ($599) a ton on the Malaysia Derivatives Exchange at 11:48 a.m. in Kuala Lumpur. The contract yesterday dropped 2.8 percent, the largest decline in four days. India’s imports of crude palm oil jumped 66 percent to 3.49 million tons in the eight months ended June, while purchases of soybean oil climbed 86 percent to 660,504 tons, the Mumbai-based Solvent Extractors’ Association of India said July 14. The country relies on imports to meet half its cooking oil demand. It buys palm oil from Indonesia and Malaysia, and soybean oil from Argentina and Brazil. The June-September monsoon rains, which account for four- fifths of the nation’s annual rainfall, were 27 less than normal from June 1 to July 15, with showers being deficient in 22 of 36 weather divisions, the weather office said last week. Peanuts were sown on 2.57 million hectares as of July 16, down from 2.76 million hectares, the farm ministry said July 17. Soybeans have been planted to 7.14 million hectares, compared with 7.24 million hectares a year earlier, the ministry said. July 23 (Bloomberg) -- Oil traded little changed after falling yesterday as a government report showed a smaller-than- forecast decline in crude inventories in the U.S., the world’s biggest energy consuming nation. Supplies dropped 1.8 million barrels to 342.7 million in the week ended July 17, the Energy Department said yesterday. A 2.1 million-barrel decrease was forecast, according to the median of 15 estimates in a Bloomberg News survey. Crude oil for September delivery traded 25 cents lower at $65.15 a barrel on the New York Mercantile Exchange at 9:44 a.m. in Sydney. Yesterday, it fell 21 cents, or 0.3 percent, to settle at $65.40. Prices are up 46 percent since the start of the year. U.S. stocks declined, with the Standard & Poor’s 500 Index slipping 0.1 percent from an eight-month high in New York. The Dow Jones Industrial Average fell 34.68 points, or 0.4 percent. The dollar traded near a seven-week low versus the euro as resilience in equities reduced demand for the relative safety of the world’s main reserve currency. It was little changed at $1.4219 versus the euro at 6:10 a.m. in Tokyo. Gasoline supplies rose 813,000 barrels to 215.4 million last week, according to the report. Stockpiles of distillate fuel rose 1.22 million barrels to 160.5 million. Brent crude for September settlement increased 34 cents, or 0.5 percent, to end yesterday’s session at $67.21 a barrel on the London-based ICE Futures Europe Exchange. MUMBAI, July 22 (Reuters) - Indian soybean and soyoil futures ended down on Wednesday tracking falls in Malaysian palm and prices are likely to fall further after Indonesia, a large palm oil exporter, removed duty on palm oil exports, analysts said. India imports about half of its annual edible oil requirement mainly in the form of palm oil from Indonesia and Malaysia. "With zero duty, palm oil imports to India may further rise in the coming weeks..supplies are not a concern," said Badruddin Khan, senior analyst, Angel Commodities Broking Pvt Ltd.
India's imports have already risen sharply, so far, in the current year and vegetable oils imports may rouch a record 8 million tonnes by the year-end in Oct 2009, a leading trade body said last week. Expectations of good yields in the U.S., the world's largest soybean producer, also weighed on prices as it may raise supplies, analysts said. If good growing weather persists through August, soybean yields in the United States could reach 44.7 bushels per acre, said Darrel Good, extension economist at the University of Illinois. Large-scale sowing in Indian states of Madhya Pradesh and Maharashtra, the country's top two producers, also weighed on prices. The benchmark October palm oil futures KPOc3 on Bursa Malaysia Derivatives Exchange ended down 2.75 percent at 2,084 ringgit a tonne. Soybean is crushed to produce soyoil, which competes with palm oil as cooking medium. Their prices often move in tandem. The spot market in central city of Indore, a hub for oilseed and edible oil trade, was closed on account of a holiday. July 22 (Bloomberg) -- Gold rose for the third time in four sessions as the dollar weakened, boosting the appeal of precious metals as a store of value. Silver gained while platinum fell. The dollar slipped as much as 0.5 percent against a basket of six major currencies as Federal Reserve Chairman Ben S. Bernanke reasserted a plan to keep benchmark U.S. lending rates at historic lows for an “extended period.” Last week, gold prices jumped 2.7 percent as the dollar slumped. “If the dollar starts to weaken significantly again, it will send gold off to the races,” said Frank McGhee, the head dealer at Integrated Brokerage Services LLC in Chicago. Gold futures for August delivery advanced $6.40, or 0.7 percent, to $953.30 an ounce on the New York Mercantile Exchange’s Comex division. The most-active contract has gained 7.8 percent this year. Bullion for immediate delivery in London rose $2.42, or 0.3 percent, to $950.92 an ounce at 7:52 p.m. local time. Silver for September delivery rose 22.2 cents, or 1.6 percent, to $13.70 an ounce in New York. “Limited inflation pressures” will let the Fed maintain target lending rates at near zero percent, Bernanke reiterated today in Senate testimony. He repeated testimony he delivered in the House of Representatives yesterday. “We are looking for signs of inflation expectations that would cause us to respond,” Bernanke said. He said the central bank will look for the “right moment” and pace to tighten monetary policy to restrain inflation. “If this were to materialize, it would certainly be bearish for gold in the long run,” Andrey Kryuchenkov, a VTB Capital analyst in London, said today in a note. The Fed cut its target for bank lending rates to zero to 0.25 percent in December while expanding credit to the economy by $1.1 trillion over the past year to mitigate the effects of the deepest recession since World War II. Some investors say that will devalue the dollar and trigger faster inflation. Platinum futures for October delivery fell $1.30, or 0.1 percent, to $1,175.70 an ounce on the Nymex. Palladium futures for September delivery slipped $1.35, or 0.5 percent, to $256.15 an ounce. July 23 (Bloomberg) -- The yen may rise for a third day versus the euro on speculation U.S. companies including CIT Group Inc. and American Express Co. will report weaker earnings today, reviving demand for the safety of Japan’s currency. The yen gained for a fourth day against the dollar yesterday after Morgan Stanley reported a larger second-quarter loss than analysts predicted and Wells Fargo & Co. said bad loans jumped. The yen and dollar may also rise before a U.S. report that economists said will show jobless claims increased, adding to concern the global recession will be prolonged. The yen traded at 132.87 per euro as of 8:55 a.m. in Tokyo from 133.18 yesterday in New York. Japan’s currency was at 93.56 versus the dollar from 93.68. The dollar was at $1.4202 per euro from $1.4220. The yen typically strengthens during times of financial turmoil because Japan’s trade surplus means the nation doesn’t have to rely on overseas lenders. Morgan Stanley said yesterday it made a loss from continuing operations of $159 million last quarter compared with earnings of $689 million in the same period a year earlier. Wells Fargo said assets no longer collecting interest climbed 45 percent to $18.3 billion as of June 30 from the first quarter. CIT said on July 21 it expected to post a loss of more than $1.5 billion for the second quarter, renewing concern the New York-based lender may have to file for bankruptcy. The number of Americans filing claims for unemployment benefits rose to 557,000 last week from 522,000 the previous week, according to a Bloomberg News survey of economists. The Labor Department will release the report today in Washington. The yen was little changed after Japan’s Finance Ministry said today the nation’s exports declined 35.7 percent in June from a year earlier. Economists predicted a decrease of 35.1 percent, according to a Bloomberg News survey. From a month earlier, shipments rose 1.1 percent. FKLI futures July contract rose 10 points higher to close at 1145 as compare to previous trading session with total 7,758 lots traded in the market. FKLI was opened lower and traded higher as most of the regional indices were firm but pull back slightly before market ends due to some profit taking activities. 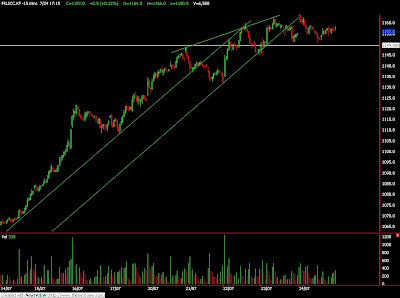 Technically, several attempts fail to breach upper channel trend line and ended up close on the channel support trend line. Based on our technical interpretation, our opinion suggests FKLI traded lower in the coming trading session provided resistance levels at 1151.5 and 1161 levels. Traders were advice to hold short position in the coming trading session while pay extra attention on support levels at 1134 and 1119 regions. Technically, CPO plunged soon after previous support levels at RM2120 were penetrated during trading session. 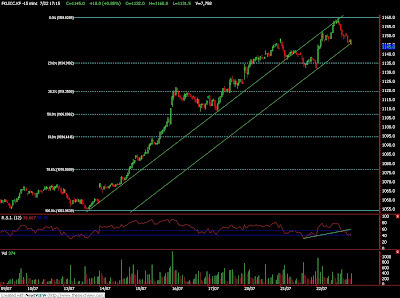 However, CPO price seems temporary support above 61.8% Fibonacci retrace level at RM2180 regions. Based on our technical analyst, our opinion suggests CPO have possibility to rebound in the coming trading session where crucial resistance levels at RM2121 and RM2150 must not be violated. However, traders were advice to hold short position as CPO still seen riding on bear rally provided resistance levels were not violated. 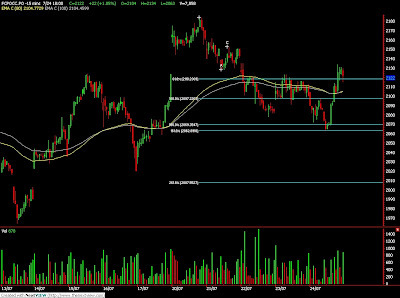 Support levels seen at RM2070 and RM2020. July 22 (Bloomberg) -- Oil fell for the first time in six days after an industry report showing an increase in crude supplies in the U.S. prompted speculation government figures due today may show an unexpected gain. Stockpiles rose 3.1 million barrels to 349.9 million last week, the first increase since April, the industry-funded American Petroleum Institute reported yesterday. An Energy Department report today is forecast to show that crude supplies in the biggest energy consuming nation dropped 2.1 million barrels, according to a Bloomberg News analyst survey. Crude oil for September delivery dropped as much as 1.2 percent to $64.84 a barrel on the New York Mercantile Exchange, and was at $64.94 at 9:18 a.m. Sydney time. Yesterday, it rose 32 cents to end the session at $65.61. The August contract expired yesterday. Oil-supply totals from the API and DOE moved in the same direction for the past six weeks and 76 percent of the time over the past four years, according to data compiled by Bloomberg. Inventories of gasoline rose 1.3 million barrels to 213.6 million, the API report said. The Energy Department is expected to say supplies increased by 650,000 barrels in the week ended July 17, according to the analyst survey. Gasoline for August delivery dropped 1.95 cents, or 1.1 percent, to $1.7925 a gallon New York at 8:58 a.m. Sydney time. Yesterday, it climbed 2.26 cents, or 1.3 percent, to $1.812, the highest settlement since July 1. Stockpiles of distillate fuel, a category that includes diesel and heating oil, probably rose 1.5 million barrels, according to the survey. The department is scheduled to release its weekly petroleum supply report today at 10:30 a.m. in Washington. Brent crude for September settlement rose 43 cents, or 0.7 percent, to end the session at $66.87 a barrel on London’s ICE Futures Europe Exchange. It was the highest close since July 1. July 21 (Bloomberg) -- Soybeans may rise as high as $11.50 a bushel by the end of this year, and corn and wheat prices may increase as the declining dollar boosts export demand, said Jack Scoville, a vice president at Price Futures Group in Chicago. Soybeans may trade from $9 to $11.50, as much as 27 percent above today’s price, Scoville said at a conference in Chicago. Corn may range from $3 to $3.75 a bushel, with wheat at $5 to $7.50 a bushel, he said. The dollar has dropped 12 percent against a basket of six major currencies from this year’s high on March 4. “A lower dollar has helped keep our prices competitive around the world,” Scoville said. “Strong demand, especially from China,” is boosting soybean prices, he said. Corn and soybeans may rise after wet weather in parts of the Midwest delayed planting, he said. Corn futures for December delivery fell 11.75 cents, or 3.5 percent, to $3.22 a bushel on the Chicago Board of Trade. Earlier, the price touched $3.2025, the lowest for a most-active contract since Dec. 8. Soybean futures for November delivery tumbled 18 cents, or 2 percent, to $9.05 a bushel. The price has dropped 7.7 percent this year. Wheat futures for September delivery fell 7.5 cents, or 1.4 percent, to $5.3475 a bushel. July 22 (Bloomberg) -- The yen rose for a second day against the euro on concern U.S. commercial lender CIT Group Inc. will file for bankruptcy, renewing demand for safer assets. The Australian dollar fell from near a one-month high against the U.S. currency before a government report that economists say will show the annual inflation rate dropped, backing the case for the central bank to keep interest rates low. The pound dropped from near a three-week high against the dollar after the U.K. government said the budget deficit climbed in June to the highest for that month since records began in 1993. “Doubts remain about whether the U.S. financial industry will make a sustained recovery,” said Soichiro Mori, manager of the foreign-exchange business promotion department at FXOnline Japan Co., a margin-trading company. “Investors may cut back long positions on higher-yielding currencies against the yen.” A long position is a bet an asset will rise. The yen strengthened to 132.92 per euro as of 8:32 a.m. in Tokyo from 133.36 yesterday in New York. Japan’s currency gained to 93.57 per from dollar 93.73. The dollar traded at $1.4212 per euro from $1.4226. Australia’s currency fell to 81.53 U.S. cents from 81.82 cents in New York yesterday, when it rose to 81.93 cents, the highest since June 12. The pound dropped to $1.6435 from $1.6459. It climbed to $1.6558 on July 20, the strongest since June 30. Australia’s consumer price index increased 1.5 percent last quarter from a year earlier, after gaining 2.5 percent in the prior three months, according to a Bloomberg News survey of economists. The Bureau of Statistics will release the figures at 11:30 a.m. in Sydney. The Reserve Bank of Australia aims to keep inflation between 2 percent and 3 percent on average. Benchmark rates are 3 percent in Australia, compared with 0.1 percent in Japan and as low as zero in the U.S., attracting investors to the South Pacific nation’s higher-yielding assets. The risk in such trades is that currency market moves may erase any profits. New York-based CIT said yesterday it expected to report a loss of more than $1.5 billion for the second quarter and may need to file for bankruptcy if it’s unable to tender for notes maturing next month. FKLI futures July contract fall 7.5 points lower to close at 1135 as compare to previous trading session with total 7,325 lots traded in the market. FKLI was opened higher but traded lower later as regional indices were traded weak and especially Hang Seng Indices. Technically, FKLI seems break down from the hourly support trend line after manage to reach new high at 1148.5 levels; 3.5 point higher than 1145 of 223.6% Fibonacci projection levels and formed at Dark Cloud formation in the daily chart. Based on our technical analyst, our opinion suggests FKLI might soon undergo severe correction phase with immediate support levels seen at 1126 and 1111 regions. Traders were advice to hold short position while place tight stop order around resistance levels at 1143 and 1153 regions. FCPO 3rd month Oct Futures contract fall mildly RM17 lower to close at RM2143 levels as compare to previous trading session with 8,715 lots traded in the market. CPO price seem traded sideways through entire trading session despite crude oil and soybean traded weak during electronic trading session. Technically, several attempts to test support at RM2120 levels were spotted but support levels seems temporary holding well against the selling pressure. Based on our technical wave count, our opinion suggests CPO currently seems supported above RM2120 and RM2070 regions. 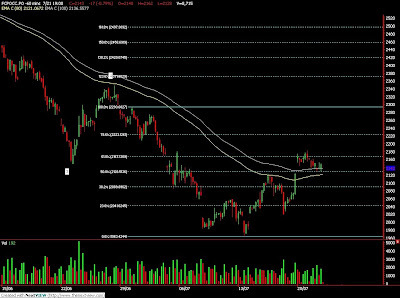 Failure to hold above the support levels shall indicate great selling pressure. Traders were advice to hold short position once support levels were violated while be cautious around resistance levels at RM2162 and RM2185 regions. July 21 (Bloomberg) -- Crude oil pared gains, trading below $64 a barrel, on speculation fuel stockpiles will increase in the U.S., the world’s largest energy user. U.S. gasoline inventories probably rose last week, according to a Bloomberg News survey. That would be the sixth week of increases during what is typically the peak demand season for the fuel. Stock markets in China, the second-largest oil user, declined from a 13-month high on concern that this year’s rally may be overdone. Crude oil for August delivery was at $63.63 a barrel, down 35 cents, on the New York Mercantile Exchange at 3:08 p.m. Singapore time. It earlier rose as much as 56 cents, or 0.9 percent, to $64.54 a barrel. Oil has fallen 13 percent from an eight-month high of $73.38 reached on June 30. The August contract expires today. The more-active September contract fell as much as 76 cents, or 1.2 percent, to $64.53 a barrel. Oil advanced yesterday along with the U.S. stock market after a gauge of economic indicators rose in June. The Shanghai Composite Index fell 32.92, or 1 percent, to 3,234.00 at 2:08 p.m. The gauge has surged 78 percent this year. U.S. crude oil stockpiles probably fell for a 10th week out of 11, a Bloomberg News survey showed. Inventories declined 2.25 million barrels in the week ended July 17, according to the median of 12 estimates by analysts before an Energy Department report tomorrow. Gasoline inventories probably increased 850,000 barrels from 214.6 million. Supplies of distillate fuel, a category that includes heating oil and diesel, probably rose 1.5 million barrels from 159.3 million. The Energy Department is scheduled to release its report tomorrow at 10:30 a.m. in Washington. Gasoline for August delivery fell as much as 1.14 cents, or 0.6 percent, to $1.7780 a gallon on the New York exchange. Refiners in China, the world’s largest energy consumer after the U.S., increased operating rates for an eighth week to 85.1 percent of capacity on July 16, said CBI China, a Shanghai- based commodities researcher. Brent crude for September settlement declined as much as 75 cents, or 1.1 percent, to $65.69 a barrel on London’s ICE Futures Europe Exchange. The contract was at $65.88 at 3:12 p.m. Singapore time. July 21 (Bloomberg) -- Soybean futures in Chicago declined on speculation that crushers in China, the world’s biggest importer, may slow overseas purchases as the government releases local stockpiles for sale into the domestic market. China will auction 500,000 metric tons of soybeans on July 23, the state-backed China National Grain and Oils Information Center said yesterday. The sale is meant to ensure local supplies are adequate and to stabilize prices, the center said in a separate report July 17. “That’s one of the main reasons” soybean prices fell, Jonathan Barratt, managing director at Commodity Broking Services Pty in Sydney, said today. Prices are “coming back from an awful big high. This is just a correction,” he said. Soybeans for November delivery fell as much as 0.8 percent to $9.1550 a bushel in after-hours electronic trade on the Chicago Board of Trade, after adding 0.2 percent earlier. The contract traded at $9.1650 at 2:40 p.m. in Singapore. The most-active soybean futures contract has fallen 26 percent from a nine-month high of $12.365 on June 5 on concern that favorable weather in the U.S. will boost yields in the world’s biggest grower and exporter, increasing global supplies. China’s soybean imports totaled a record 4.71 million tons in June, according to customs data. The sale from state stockpiles planned for next week would be 11 percent of that figure, according to Bloomberg calculations. Wheat for September delivery was little changed at $5.4275 a bushel in Chicago at 2:41 p.m. Singapore time, after declining as much as 0.4 percent earlier. Weather in the northern plains of the U.S. will help developing wheat crops, DTN Meteorlogix LLC said in a report yesterday. No significant delays to the remaining harvest are expected in the eastern Midwest, it said. The Midwest is the largest growing region in the U.S.
About 72 percent of the winter-wheat crop was harvested as of July 19, up from 66 percent a week earlier, the U.S. Department of Agriculture said yesterday. Wheat exports from the U.K. expanded 11 percent to 233,238 tons in May from 209,295 tons a month earlier, according to customs data released yesterday. Morocco’s soft-wheat harvest more than doubled in June through the first half of July to 1.51 million tons from 713,000 tons a year earlier, ONICL, the government grain office, said in a report. Corn for December delivery lost as much as 1 percent to $3.3050 a bushel in Chicago at 2:36 p.m. Singapore time after rising as much as 0.4 percent earlier. Cool temperatures in the Midwest will be favorable for pollinating the corn crop, Meteorlogix said in a separate report. Rain has come in time to ease the stress to corn crops in the northern plains of China, it said. China is the world’s second- biggest corn grower and consumer, according to the USDA. July 21 (Bloomberg) -- Crude oil rose for a fifth day as equities climbed and the dollar dropped against the euro, bolstering the appeal of commodities. Oil advanced along with the stock market after a gauge of economic indicators rose in June, signaling that the worst of the recession may be over. Japanese equities advanced as CIT Group Inc. agreed to a loan to stave off bankruptcy and Goldman Sachs Group Inc. lifted its estimate for the Standard & Poor’s 500 Index on improving earnings. Crude oil for August delivery rose as much as 56 cents, or 0.9 percent, to $64.54 a barrel on the New York Mercantile Exchange. It was at $64.42 a barrel at 10:23 a.m. in Sydney. Yesterday, it gained 42 cents, or 0.7 percent, to $63.98, the highest settlement since July 6. The August contract expires today. The more-active September contract increased 24 cents, or 0.4 percent, to $65.53 a barrel. The Standard & Poor’s 500 Index rose 1.1 percent to its highest level since November, and the Dow Jones Industrial Average rallied 104.21 points to close at a six-month high. The Nikkei 225 Stock Average rose 113.93, or 1.2 percent, to 9,509.25 as of 9:05 a.m. in Tokyo, a fifth-straight climb. The broader Topix index added 1.4 percent to 890.16. Japan’s markets were closed yesterday for a holiday. The Conference Board’s gauge of the economic outlook for the next three to six months increased 0.7 percent, more than forecast, after a revised 1.3 percent gain in May, the New York- based research group said yesterday. It is the first time the index has climbed for three consecutive months since 2004. The U.S. currency traded at $1.4234 per euro at 6:09 a.m. in Tokyo, after falling 0.9 percent yesterday and reaching $1.4249, the weakest level since June 5. Gasoline for August delivery rose 0.17 cents to $1.7911 a gallon at 10:12 a.m. Sydney time on the New York exchange. Yesterday, it gained 1.95 cents, or 1.1 percent, to settle at $1.7894, the highest since July 2. China’s oil-processing volume rose for a fifth month to a record in June as faster economic growth boosted fuel demand and refining profits encouraged production, the Chinese government said last week. Processing climbed to 31.9 million metric tons, or about 7.76 million barrels a day. Brent crude for September settlement gained 21 cents to $66.65 a barrel at 10:18 a.m. in Sydney on London’s ICE Futures Europe Exchange. Yesterday, it rose $1.06, or 1.6 percent, to end the session at $66.44 a barrel, the highest close since July 2. July 20 (Bloomberg) -- Gold climbed to a five-week high as a weaker dollar and higher oil prices boosted the metal’s appeal as an alternative investment and a hedge against inflation. Other precious metals also gained. The U.S. Dollar Index, a six-currency gauge of the greenback’s value, fell to a six-week low on speculation that European and U.S. economic reports this week will show the global recession is easing, sapping demand for a refuge from risk. Oil climbed to the highest in almost two weeks. “Gold is moving up today due to the lower U.S. dollar,” said Lannie Cohen, the president of Capitol Commodity Services Inc. in Indianapolis. Gold futures for August delivery gained $11.30, or 1.2 percent, to $948.80 an ounce on the New York Mercantile Exchange’s Comex division. Earlier, the price reached $955.40, the highest for a most-active contract since June 12. Bullion for immediate delivery in London rose $12.32, or 1.3 percent, to $949.82 an ounce at 7:52 p.m. local time, after earlier reaching $955.28, the highest since June 12. The precious metal will have “short-term resistance” at $963, while a close above $993 would spur a “quick rally” to $1,250, Cohen said. In the near term, “the healthier macro outlook, together with weak physical demand, has put gold prices under pressure,” Barclays Capital analysts including Gayle Berry and Suki Cooper in London, said today in a report. “We see potential for gold to strengthen later in the year,” they said. Barclays expects spot-gold prices to average $940 an ounce this year and $970 in 2010, according to the report. Silver spot prices are expected to average $13.50 an ounce in 2009 and $14.20 next year, according to the report. Gold increased to $952.75 in the London afternoon “fixing,” the price used by some mining companies to sell their output, from $952.25 in the morning fixing. Crude-oil futures, used by some investors as an inflation gauge, climbed as much as 2.1 percent to $64.90 a barrel in New York. Oil advanced 6.1 percent last week, while the dollar index fell 1.1 percent, the most in almost two months. Gold tends to rise when the U.S. currency weakens. The MSCI World Index of shares gained for a sixth day on optimism that the first global recession since World War II is easing. A global recovery may accelerate the pace of inflation. Silver for September delivery climbed 22.2 cents, or 1.7 percent, to $13.625 an ounce. The most-active contract has risen for five straight sessions, the longest advance since January. FCPO 3rd month Oct Futures contract rose RM39 higher to close at RM2162 levels as compare to previous trading session with 7,975 lots traded in the market. CPO price were traded firm as soybean oil and crude oil overnight and electronic trading were traded firm during the trading sessions. 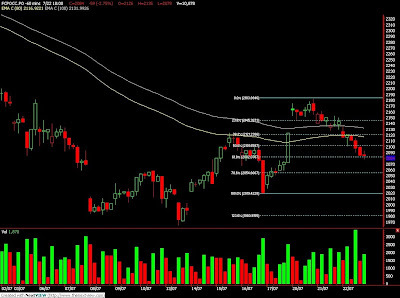 Technically, CPO seems fails to penetrate resistance levels at RM2170, 61.8% Fibonacci retrace levels. Based on our technical studies, our opinion suggestion CPO would trade lower provided resistance levels at RM2180 and RM2222 were not violated. Traders were advice to hold short position in the coming trading session while be cautious around support levels at RM2150 and RM2120 regions. FKLI futures July contract rose 19 points higher to close at 1142.5 as compare to previous trading session with total 7,293 lots traded in the market. FKLI were traded higher as regional indices were traded strong during trading session. 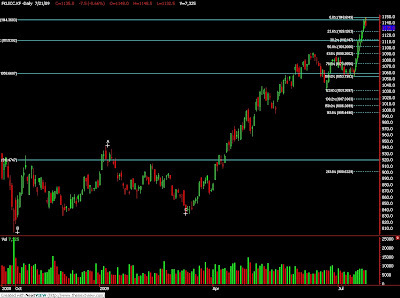 Technically, FKLI seems tested 223.6% Fibonacci projection levels at 1145 regions. Based on our technical interpretation, our opinion suggest FKLI would starts to retrace if resistance levels at 1145 and 1161 fails to overcome by the buying interest. Traders were advice to hold short position in the coming trading session while be cautious around support levels seen at 1137 and 1126 regions.